Probably one of the last things you want to think about on a beautiful, sunny day is a Boating Accident. Unfortunately, accidents do happen and that’s when you will be glad that you purchased boat insurance. Anchor Marine Repair is there when you need us the most. 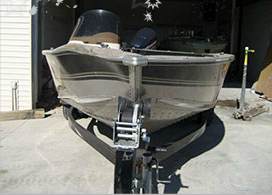 Our experienced technicians handle all types of Aluminum Boat Repair due to Storm Damage or Accidents. 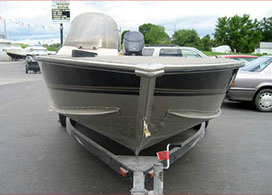 We provide reliable, quality workmanship and have designated as an Insurance Approved Aluminum Boat Repair Company. Let assist with the insurance claims process and work directly with your insurance company from estimate to restoration. For those boat aluminum boat owners with Boat Insurance, Anchor Marine Repair offers a seamless process to total restoration of your boat. We are an Insurance Approved Aluminum Boat Repair Company with the skills and equipment to ensure fast repair for Accidents or Storm Damage. Popular brands of aluminum boats that we work on include Lund, Crestliner and Alumacraft. Anchor Marine Repair should be one of the first calls you make if your aluminum boat has been damaged. We have a state-of-the-art facility that can handle all types of Boat Repair Work. Contact us for Top Quality interior and exterior storm damage restorations as well as Boat Collision Repair for accidents. Anchor Marine Repair has been Insurance Approved to complete aluminum boat repair services. We provide seamless restoration services from estimate to completion.